Twelve aspiring water-colourists attended a two day workshop at AWAS on the 18th and 19th October. The springtime ambience was truly reflected in the enthusiasm of all as we diligently attended to the full schedule that Ross had carefully prepared. Ross is an excellent teacher, patient and helpful. We all feel that we have taken with us many valuable tips and improved techniques as a result of his tuition. The shared morning teas were provided by us and thoroughly enjoyed. A very big thank-you to Ross, also to Jenny Wallace, who as usual, did a great job organising the weekend. THIS WORKSHOP IS NOW FULL!!!! BUT THERE IS A WAITING LIST. PLEASE CONTACT JENNY WALLACE FOR FURTHER DETAILS. 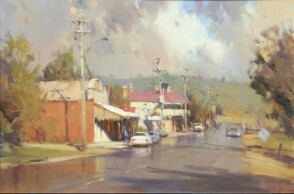 Ross Paterson is Australia’s foremost landscape and rural town water-colourist. He is renowned Internationally and within Australia for his ability to created light filled, atmospheric paintings. Ross is an excellent, highly sought after tutor. I have been to a couple of Ross’s workshops and they are excellent value and learning no matter how experienced you are. We need to have 10 attendees for this workshop to proceed. We will probably take a themed approach rather than a generic approach to this workshop, just to make it a bit different. The theme could possibly be “Rural towns and Surrounds” which covers everything from learning how to bring streets/buildings/sheds/ old vehicles, barns ,farm buildings to life in the Australian light. Mark these dates in your diary. To register your interest in attending this workshop please email or phone Jenny Wallace – jens@bigpond.net.au or phone 02 6026 4800, as soon as possible. For Workshop Enrolment Form, click here.